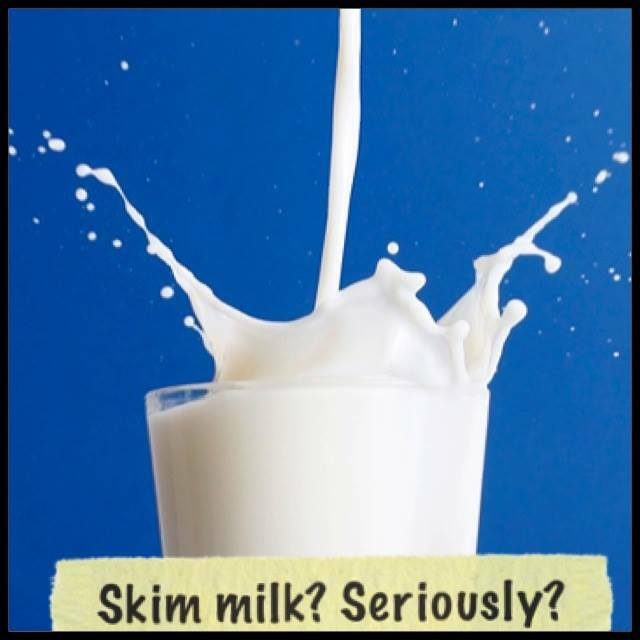 For starters, before skim milk is stored into bottles, its usually got a chalky taste, bluish color and a very thin texture that is no where close to real whole natural milk (since pretty much all the fat is out!) To make this weird liquid “normal” POWDERED MILK SOLIDS are added into this. The main problem with powdered milk is that it has been forced through tiny holes at such high temperatures during processing that it leaves behind cholesterol raising “oxidized fat”, which causes blocks in your arteries. The proteins found in milk solids are so denatured that it is not even really recognized by your body and can cause inflammation. Vitamin A, D , E and K are all FAT SOLUBLE nutrients, you drink skim milk, you don’t get any of these real Nutrients! And ofcorse, they will fortify your milk with chemically synthesized vitamins, but let’s leave that topic for another day. School kids are the biggest guinea pigs of this misinformed nutritional advice and yes! I guess a walk in the mall is all it needs to see how skinny and healthy all the kids are getting! So if you’re a fan of dairy, go for the real full fat versions! Always!